Click here to view current Oncology opportunities. The University of Michigan Health System’s Cancer Center (UMCC) is a nationally recognized center of excellence for cancer treatment and research, utilizing the talents of nearly 300 cancer clinicians and researchers. Experts in virtually every type of cancer – from common to incredibly rare – these professionals work together in clinical programs which bring new prevention, detection and treatment discoveries to more than 25 specialty cancer care clinics. Our Patients and Families – 7W is a 32-bed unit comprising a mix of adult bone marrow/stem cell transplant and hematology/oncology patients. The delivery of care is based on a collaborative approach among nursing, medicine and other services. Our highly specialized team promotes optimal care based on high professional standards. The patients of 7W are given dedicated care throughout the continuum of their transplant. Our Nursing Team – Nursing on 7W is highly skilled and specialized in the practice of bone marrow/stem cell transplant. The 7W environment fosters the professional development of bone marrow/stem cell transplant nurses, individually and collectively. In the ever changing life of the transplant patient, 7W Nurses are highly skilled patient advocates and maintain an organizational structure and function that is responsive to the changing needs of this population. Typically RN’s on this unit are cross-trained to work on 8E. Nursing on 7W is highly skilled and specialized in the practice of bone marrow/stem cell transplant. The 7W environment fosters the development of bone marrow/stem cell transplant nurses, individually and collectively. It maintains an organizational structure and function that is responsive to the changing needs of this population. Typically RN’s on this unit are cross-trained to work on 8E. 8E is an acute care unit, located in Mott Children’s Hospital, that cares for adult surgical patients. Typical patients include endocrine surgery, benign gyn surgery, medicine hematology patients including blood cancers- leukemia, lymphoma, myeloma, blood diseases- aplastic anemia, immune and genetic diseases. All nurses on this unit receive the required hospital based training and competency check off for chemotherapy administration and EKG interpretation training. We have telemetry capability to provide the highest possible level of care for our patient population. Typically RN’s on this unit are cross-trained to work on 7W. Patient and Family centered care the focus of nursing care delivery on 8A. We deliver individualized treatment to the 32 acute care patients assigned to the unit. A variety of Oncology patients are cared for here, the majority of whom have an underlying hematology oncology diagnosis. As part of the University’s Cancer Program, the nursing staff is able to take advantage of all the educational and career opportunities pertinent to this specialty. Patient care is based on an assessment of the individual patient and family’s needs and addresses their physical, emotional and spiritual needs. A multidisciplinary team is utilized to be successful in meeting this goal. Nursing care focuses on patient and family education, emotional and physical care, and on discharge planning. When terminal care becomes the goal, it is directed toward the achievement of a dignified and pain free death. 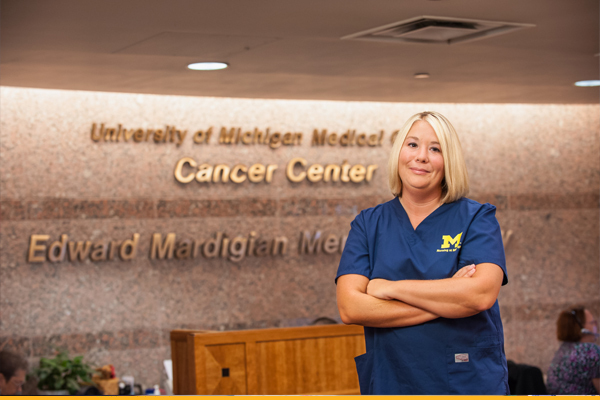 The University of Michigan Outpatient Comprehensive Cancer Center is staffed by a team of highly motivated professional nurses, dedicated to the ongoing care of patients with cancer. Our nurses and staff collaborate with an interdisciplinary team to assist cancer patients who may be receiving cancer treatments, managing side effects, and balancing the physical, emotional and spiritual changes – all in an effort to maintain maximum quality of life.